Single from the Antiqcool album "Cabin Fever"
I like to paint mental pictures with my songs around themes of love, friendship and life. Each one tells it’s own little story and takes you on an emotional journey, both lyrically and musically. I get my songs into your head, where they will set up camp and lay down roots. Over time you will get to know them, and hopefully, think of them as friends. I find it quite difficult to describe myself as an artist, and the music I create. Although I tinker with other instruments, I feel most at home playing acoustic or electric guitar, I’ve been playing on and off since I was six years old, so I guess it’s a big part of who I am now. The idea for a song can start with a few words, or a guitar riff. I spend many hours recording basic ideas that sound interesting, then overdubbing other guitar parts, until I hear something that sounds right. If I get Goosebumps, it’s usually a good sign. If you, the listener, play the finished song and get Goosebumps, then I guess I’ve done a good job. I enjoy the process of creating arrangements for guitar, often a three or four part ensemble with other instruments thrown into the mix to add a little extra colour, and variety. I try to make my songs interesting, but not too complicated. I want people to go away humming the tunes I have created, I love it when people say “I can’t get that song out of my head”. I recommend you stop reading and start listening now, so that you can make up your own mind. Find out more on our website. 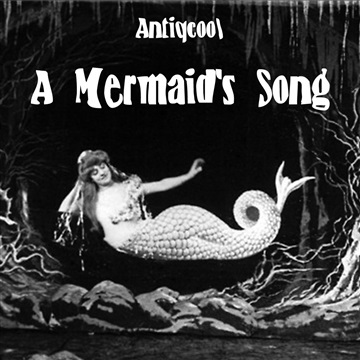 Single from the Antiqcool album "Cabin Fever" Also available to download from NoiseTrade Sicknote Publishing (Antiqcool) control 100% of master and publishing rights to "A Mermaid's Song".